You can’t beat the $/R Value of mineral wool. It is a good insulator with noise control properties. 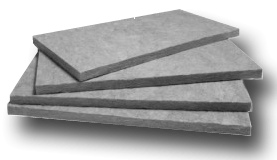 Mineral wool is both moisture and mold resistant with practical use temperature of up to 1100F. Will remain incombustible throughout the temperature range with a melting temperature of 2000F. Mineral Wool bats are semi rigid and can support their own weight making them and excellent option for insulating panels. Mineral Wool bats are semi rigid and can support their own weight making them an excellent option for insulating panels.